PCWin Note: KontrolPack 2.0.4 download version indexed from servers all over the world. There are inherent dangers in the use of any software available for download on the Internet. PCWin free download center makes no representations as to the content of KontrolPack version/build 2.0.4 is accurate, complete, virus free or do not infringe the rights of any third party. PCWin has not developed this software KontrolPack and in no way responsible for the use of the software and any damage done to your systems. You are solely responsible for adequate protection and backup of the data and equipment used in connection with using software KontrolPack. Bello Network Monitoring WinGUI - bello network monitoring offers reliable network and website monitoring, web or windows user interface. Sensor types include PING, PORT, HTTP, HTTPS, Advanced HTTP (e.g. for content checks), HTTP Transaction, DNS, SMTP, POP3, SNMP, FTP and more. 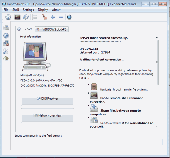 TeamViewer - TeamViewer is a simple and fast solution for remote control, desktop sharing and file transfer that works behind any firewall and NAT proxy. AthTek NetWalk Free Edition - AthTek NetWalk is recognized as the most excellent packet sniffing and network monitoring software in the world. With this software, both experienced and new network administrators can enhance their network management efficiently. 5Loaves - An open source, cross platform, secure, internet tunneling platform with file transfer, web server, remote admin, proxy, and load balancing. NemoBar - Nemobar stands for Network Monitoring Bar and is certainly a handy tool which helps users to check on their internet traffic. Capsa Network Analyzer Free Edition - Free packet sniffer (network analyzer or network sniffer) for network monitoring and troubleshooting. It allows you to monitor network operations, isolate & solve network problems, identify network bottleneck & bandwidth use, and replay packets. Free Monitor Tool - This is a free edition of AthTek NetWalk, which can help network administrators in network monitoring and packet sniffing greatly. It takes advantages of many popular network monitoring tools and achieves better performance. Reduce Car Costs - Save money by always having your car costs under control with this program: Fast and simple collection of all expenditure for your car/motorbike. Collect your insurance costs, car tax, repair costs and also your fuel costs. With many tips. Twin Folders - Synchronize files between your computers with this easy-to-use utility. It can synchronize and backup/restore your files, access FTP folders and work on timer and/or folder content change event. More Software of "Thelliez Thomas"